It’s the eighth of our Friday-to-Friday round-ups of “blasphemy”-related news and views. 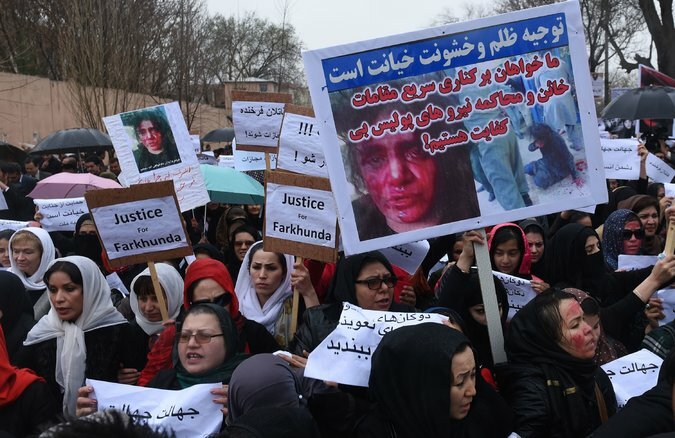 There has been continued international attention, national soul-searching, as well as local protests, in response to the mob killing of a young graduate, Farkhunda, by a large group of men in the streets of Kabul, Afghanistan, last week. President Ashraf Ghani has ordered a probe, and details have emerged about the nature of the killing. Farkhunda, a theology graduate, was apparently a teacher of Islamic studies, and not mentally ill as had been initially reported (this appears to have been put out by the family in order to deter any immediate reprisals against them, a pattern that’s been seen before in defence against mob “blasphemy” violence). “That too is a common sight. Women come to ask such men for charms or amulets to help deal with a family problem – to bring good health to their husbands, to keep their sons safe in the army, or to find good husbands for their daughters. It is a source of income for such poorly educated mullahs – however dubious the service. “Counsel for the complainant, Advocate Ghulam Mustafa Chaudhry, told the court that his client was the imam of a mosque situated next to the shrine. He said he woke up early morning for tahajjat prayers and heard a commotion in the graveyard next to the mosque. He said Ali went to the graveyard and saw the caretaker of the shrine directing a devotee to blaspheme. Ali told them to stop but they used abusive language and threatened him with dire consequences, Advocate Chaudhry said. Meanwhile, he said, Ali had recorded parts of the conversation in which one of the two could be heard blaspheming. The caretaker of the shrine told the court that Ali was trying to implicate him in a false case. He said Ali had visited him and asked him to handover some of the shrine land so that he could build his hujra on it. The caretaker said that he had refused and Ali had threatened him with dire consequences. The devotee told the court that he had no connection with the case and had been falsely accused. … His counsel had told the court that the audio evidence presented in the case had not been verified by the Forensic Science Laboratory, which had sent back a note saying that they did not have the equipment required to analyse audio evidence. He said that Ali had told the court that he had recorded the verbal exchange from the mosque. “How can a low grade Chinese-made phone record audio from a distance of at least 35 feet away,” he said. In another of the slightly more positive signs from Pakistan recently, a judge at the High Court in Lahore threw out a “blasphemy” petition against the administration of a school, for supposedly including a “blasphemous” question in an exam paper. The judge, in a full courtroom, first discouraged the complainant, saying it was because of such issues that the country was lagging behind. He said they brought a bad name to the country. Later, he dismissed the petition. Some members of the legal fraternity present in the courtroom told The Express Tribune that they had appreciated the judge for taking the stance. They said that the judiciary could play a decisive role in stopping people from using religion to settle personal scores. 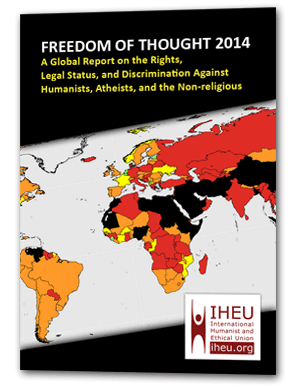 In an open letter to IPU delegates [PDF], co-signed by dozens of human rights advocacy organizations including the IHEU and freedom of expression specialists, the signatories dispute Jordan’s false reading of freedom of expression, noting that in fact the “Respect for Religions” resolution “is incompatible with international human rights law”. “Professor Dr Mohamad Tajuddin Mohamad Rasdi said she [Aisyah] was not questioning God’s law, but laws that were written by PAS and would be enforced by the Islamist party. ‎”It’s funny that they can investigate her for blasphemy when the hudud she was commenting on was the hudud as interpreted by PAS,” he told The Malaysian Insider when met at the sidelines of a forum on religious freedom today. “I thought the police, the authorities are supposed to be non-partisan. But they are taking action based on one political party’s interpretation of hudud,” he said. … When asked if he believed Aisyah could have presented the video differently, Tajuddin replied that she had carried it out in the same spirit as the video’s original host. “That is the style of Kupas – hard-hitting, provocative and satirical. She was given a script and she acted it out as required. She was only a stand-in for the original host. “And those people who were offended by her style don’t watch Kupas regularly, they don’t understand its philosophy or that it is satire,” said Tajuddin. There’s been some less than ideal innovation in religion in Egypt, this week, with what is reportedly the country’s first ever conviction of an Islamic leader for offending Christianity, upheld by an appeals court. Ahmed Mahmoud, popularly known as Abu Islam, was found guilty of violating an Egyptian law against public displays of contempt for religion. His conviction is the first for a Muslim charged with offending against Christianity. Abu Islam, a militant Salafist, had burned Bible outside the US embassy in September 2012, to protest the burning of a Qu’ran by the American Evangelical preacher Terry Jones. He was originally sentenced to an 11-year prison term for the offense, but that sentence was reduced to a 5-year term. The court also ordered him to pay a fine of about $1,000. “With one ill-informed camp obstinately seeking repeal [of the law] and another frenzied group violently insisting it was untouchable by divine sanction, we realized that a lot of nuances were probably missing in the mix,” Zain Moulvi, a lawyer and one of the activists, told VICE News. So Moulvi, along with researcher Arafat Mazhar, decided to delve further into the controversial law and its interpretation and application over the years. On Wednesday, leaders of a number of religious parties met in Islamabad, apparently to foster “religious unity”. However, the membership, seemingly limited to “the Ummah”, focused on “blasphemy” and how to deter the supposed wave of it flooding the world from “the West” by boycotting trade and severing diplomatic ties. Such a meeting is unlikely to have any immediate effect on diplomatic relations! But it can be interesting reading how thoroughly destructive are the policies some leaders are willing to advocate in order to hear less “disrespect” about religion. “The meeting chalked out a 12-point charter, but failed to devise a strategy to combat sectarianism and religion-based terrorism in the country. The issue of blasphemy and disrespect of the Holy Prophet (peace be upon him) in the West was the focus of Unity of Ummah Conference organised by the Milli Yekjehti Council (MYC). Through a resolution, the meeting urged Pakistan and all other Muslim states to take up the matter of blasphemy with France and other European states. “If they are not ready to take action against the culprits, Muslim countries should boycott products of European countries and suspend diplomatic, cultural and trade relations with them,” the resolution said. There is some further analysis of the murder of Avijit Roy in the context of the broader rise of Islamic fundamentalism troubling the ostensibly secular democracy of Bangladesh “as the country spirals deeper into a political crisis”.